On Tuesday, November 20, 2012, Warner Archive released The Charlie Brown and Snoopy Show: The Complete Series, a DVD set containing all 18 episodes of the Peanuts Saturday morning cartoon show from 1983 and 1985. While a few episodes of The Charlie Brown and Snoopy Show have been released individually on the various "Happiness Is... Peanuts" line of DVDs, this is the first time most of the episodes have been released on DVD in the United States, and also the first time they have all been released together as a set. (5 episodes have been released previously; 13 are new to DVD in this set.) Peanuts fans have been waiting some time for such a box set, so it's great to see it arrive at last! The 18 episodes are on 2 discs with a total running time of 402 minutes. The set can be ordered for $29.95 directly from Warner, or it can also be ordered from Amazon.com (although at the time of writing, it cost several dollars more at Amazon, so be sure to compare prices). For more details about each episode, see the Charlie Brown and Snoopy Show section of the Peanuts Animation and Video Page. It's worth noting that Warner Archive DVDs are not the manufactured, pressed DVDs that you typically find in stores; they are recordable DVD-Rs that are burned on demand as customers order them. While they should play without problem in any DVD player produced in the last 10-12 years and the video quality should be as good as a regular DVD, they may not be quite as durable or long-lasting as regular DVDs. For more information, see the Warner Archive FAQ. However... it turns out that for the first batch of discs of any box set, Warner Archive actually makes pressed DVDs instead of recordable DVDs. So if you order this set within a month or two of its release date, you're likely to get "real" DVDs instead of DVD-Rs. (I can verify this - the set that I ordered on release day is pressed DVDs.) But eventually they will switch to using DVD-Rs instead. 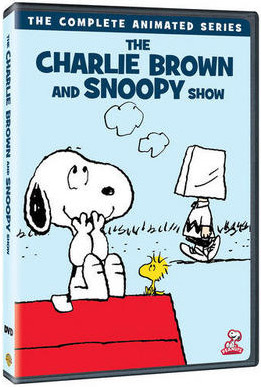 It's likely that this will be the only box set of the Charlie Brown and Snoopy Show that's ever released on DVD, and certainly it's more economical (and space efficient!) than buying the individual "Happiness Is... Peanuts" releases. Plus there's no guarantee that all the episodes of the Charlie Brown and Snoopy Show will be released individually (consider that after two years, only five episodes have been released that way). So if you're interested in getting these episodes on DVD, this set is the way to go. Well, it is about time. That is wonderful news, now we can watch all the shows!